I can’t believe that today begins the last week of February, but yes it does! That’s not going to stop me from being part of Week In Review hostessed by the lovely Meghan at Clean Eats, Fast Feets. Be sure to check out the other Reviewers when you’re finished here. It’s been a week with its ups and downs, but I made it through and that’s what matters! ~I wrote three blog posts. Still working on getting in Number Four. I think I’ll have to have a serious sit down talk with myself in order to get the fourth one in this next week. I’ll get there! ~I wrote my morning pages for the Artist’s Way every day. I’m still enjoying it so much. There’s a lot that I’m learning about myself from this process. It’s all very helpful. I was able to go to the meetup for the Artist’s Way this week because the weather cooperated. I was actually the only one to show up, but I truly enjoyed a few hours of chatting with Monica the leader of the group. She’s a fascinating lady. I’m enjoying the process in general. ~I FINALLY unearthed my exercise bike. During my big purge back in November, all of the empty boxes just got tossed on the porch. Well, that made it a little hard to get to the bike, so I slacked off. I’d sort of already been off track with the bike prior to that. Anyway…I actually can’t remember whether it was Sunday or Monday, but I reorganized the boxes and gave myself access to the bike. I exercised 30 minutes on the bike five days in a row. I have to admit that it has done wonders for me. My hips and back which have been bothering me a lot lately, feel much better. I’m going to continue with this daily. I’m feeling better every day and I’m pretty excited about it. ~We took care of some very necessary bank business and of course got caught in this week’s huge thunder-storm. We had more errands planned that day, but headed home to avoid the traffic in the rain. ~On Saturday, as is my routine, I was at Weight Watchers bright and early. My reward was a .8 (three-quarters of a pound) loss. I was happy. I’ve been working hard to stay on track and that made me happy. 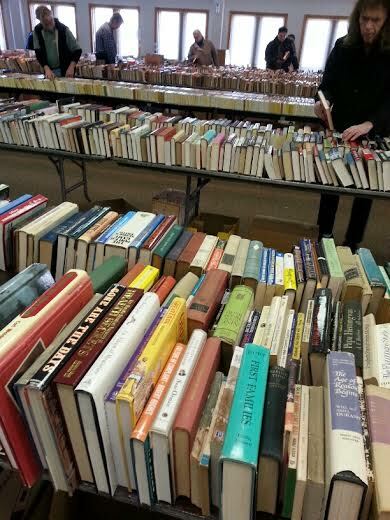 ~After Weight Watchers, Ralph and I headed to the county library for one of our favorite things…the semi-annual book sale! This isn’t the whole thing and I’m sure I missed some good finds because we didn’t get there until afternoon. I was being very careful because I’m really on the mission of weeding out the books I have, but I did buy 4 books which I think was considerable restraint on my part. I love being around books, old or new…it doesn’t matter. ~Since I’m writing this on Sunday, I’ll tell you what’s up for today. I need to go grocery shopping quickly this morning. I just need things to make my Weight Watchers veggie soup because that has been such a good tool for me over the last few weeks. Then my sister Ele and I will be going to a spiritual Gathering that we attend every few weeks. I’m really looking forward to it. That’s the Week In Review for me. Be sure to check out the other linkers over at Clean Eats, Fast Feets. We all love when you visit! This entry was posted in Uncategorized and tagged books, Week In Review, Weight Watchers. Bookmark the permalink. Thanks, Madison! I just love the book sales, but of course have TOO many already. That’s why I tried to be conservative. I was proud of myself. Have a great day! Way to bust out the bike!! I love the way exercise makes me feel, and sometimes I don’t even realize how much it improves things until I get back in the groove again. Nice job on the weight loss and your pages. You are the picture of efficiency. Thanks, Meghan, you are my guiding light. Trying to get things in order in so many ways. I do feel so much better now that I’ve been on the bike again. I’m going to try to add some minutes just to keep improving. Have a great day!